Edna Spalding: [seeing her daughter's doll at the dinner table] Possum, put that up now. Royce Spalding: Our Heavenly Father, bless this meal and all those who are about to receive it. Make us thankful for Your generous bounty, and Your unceasing love. Please remind us, in these hard times, to be grateful for what we have been given, and not to ask for what we can not have. And make us mindful of those less fortunate among us, as we sit at this table with all of Thy bounty. Amen. "Places in the Heart" is one of the more under-rated films of the 1980s. 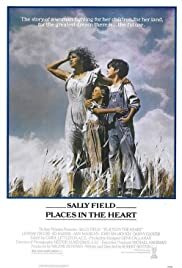 Somewhat based on director Robert Benton's experiences as a youth in Waxahachie, Texas, the film deals with one woman's (Sally Field in her second Oscar-winning performance) struggle to keep her land, house, and children after her husband is killed in a freak accident. She decides that the only way to keep her life is to grow and harvest cotton (not the easiest thing in the world to do, especially during the Depression). Drifter Danny Glover is the catalyst who can bring everything together and the blind John Malkovich (Oscar-nominated) also proves to be an asset. However, racists threaten to stop Field by eliminating Glover. On the other side of town Field's sister (Lindsay Crouse, in her Oscar-nominated role) is having troubles with her husband (Ed Harris). He is having an affair with a local school-teacher (Amy Madigan) and this development could ruin her life just as quickly as Field's life has changed. "Places in the Heart" benefits from great performances, but the direction and screenplay are also second-to-none. An excellent film that was nominated for the Best Picture Oscar in 1984. 5 stars out of 5.